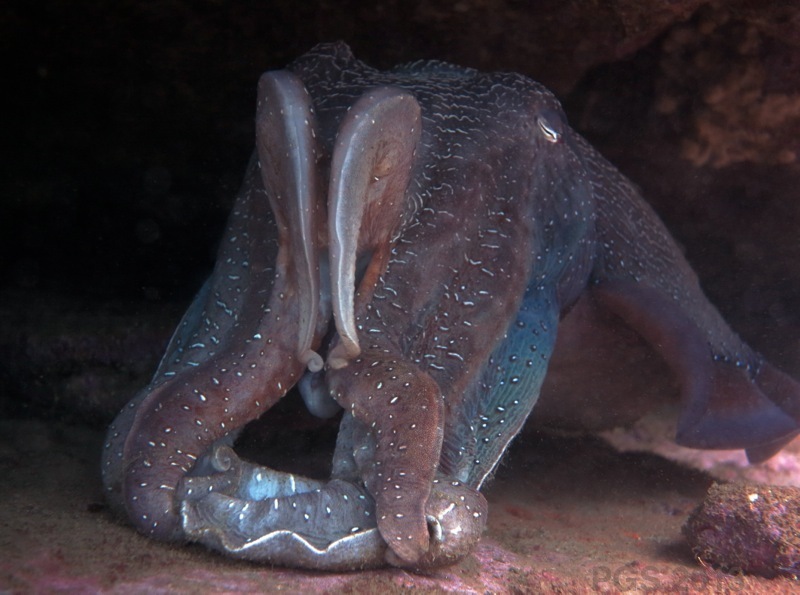 The southern winter is mating season for the Giant Cuttlefish. They gather in shallow water in larger numbers than usual, and the males perform elaborate displays – at each other and at females – while the females watch and hover. The video below is from the end of May. A number of cuttlefish were clustered round a crevice in the rocky sea floor. A large male stretches out and gives a “dynamic” display, with dark patterns moving over his body in waves. A smaller male, bright red, emerges from the crevice with arms waving like huge streamers. The displayer then edges into the crevice. 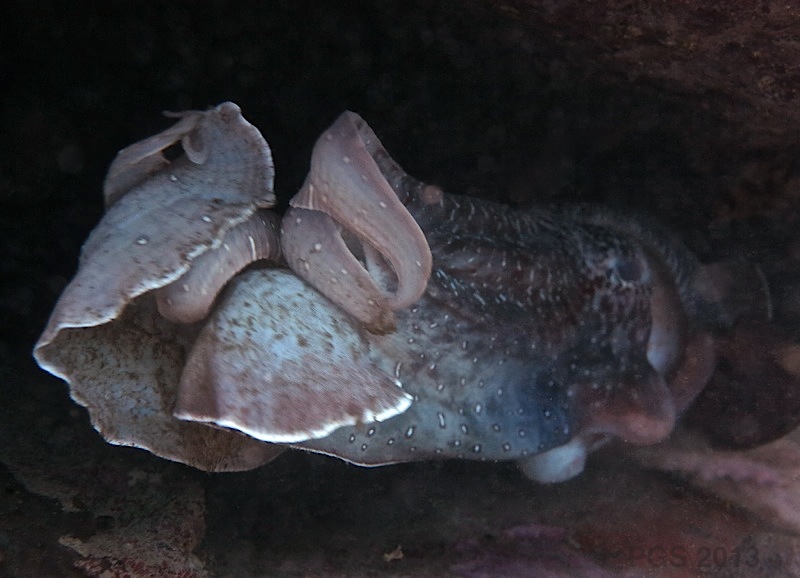 The other cuttlefish in the back of the scene is probably a female, judging from the compact held-in arms (though with Giant Cuttlefish you can never be sure). Though I had to leave town before the peak of the season, the water round Sydney was pretty active this year. Bad news, though, is coming in from further south. Whyalla is in South Australia, facing the Southern Ocean rather than the Pacific. 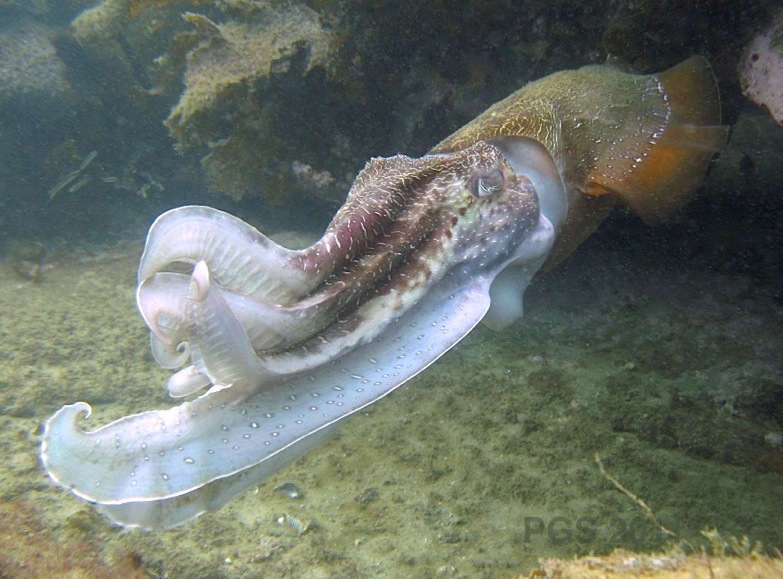 For over a decade, huge numbers of Giant Cuttlefish came to interact and mate in the shallow waters there each winter. The waters would be relatively empty for most of the year, and then they’d appear in hundreds of thousands. I wrote a post about them round this time last year. Last year was worrying because the numbers seemed to be dropping dramatically, for no known reason. We were all waiting to see what would happen this year. As far as I can tell, the latest news is even worse. Only a tiny number of animals have arrived. The annual aggregation may be coming to a close. The cause is still unknown. The South Australian government released a report back in March which began to quantify the decline and assess possible causes. I’ve only started working through it. That report was released before this year’s bad news. 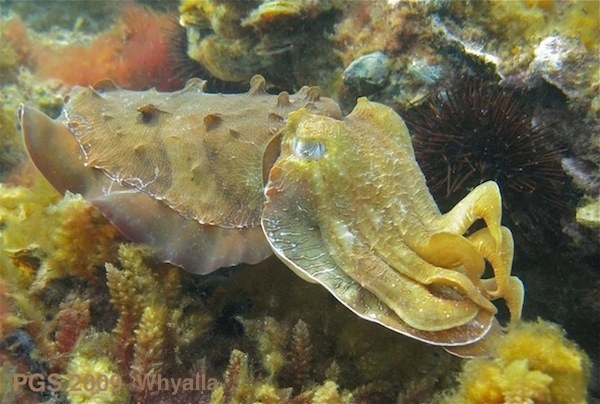 One of the things that always surprises me when watching the cuttlefish, especially during the mating season, is how quickly they sense the arrival of another cuttlefish. They can usually do this long before I see the other coming, even when I have what seems a better vantage point and when it seems that the one I am watching is half asleep, paying no attention to anything. The photos below, taken the same day as the video, are a partial example of this, though not entirely as described above. A large male under a rock ledge was going through some unusual poses, holding some inner arms up while resting like a huge dog on the sea floor. I’d noticed nothing, but the chances were that another cuttlefish was on its way in, unseen by me. Sure enough, there he was. This one was smaller, but easily supplanted the big-dog male I’d been watching. This quite often happens – a newcomer kicks out a larger resident through what looks like sheer attitude. 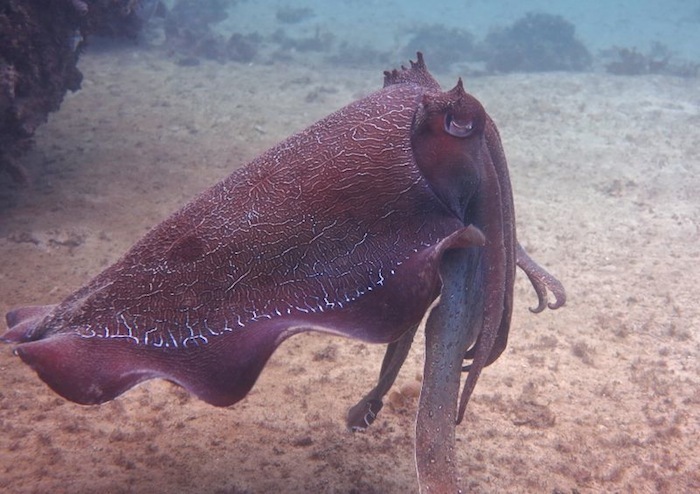 Postscript: A remarkable series of photos has gone up on Wetpixel here, including a very good shot of the rare Hairy Octopus, and a shot of the implausibly, but accurately, named Elegant Sapsucking Slug.